Hans W. Singer, Zeichnungen von Franz von Stuck, Zweihundertfünfzig Tafeln mit Lichtdrucken nach des Meisters Originalen, Leipzig, 1912 (illustrated p. 17). 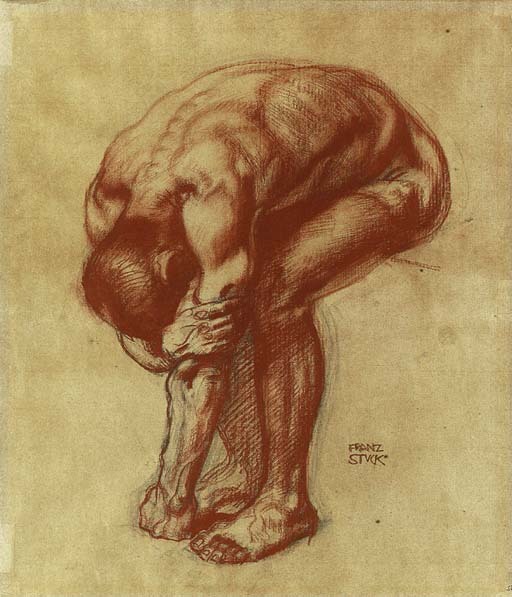 The present lot is a study for Franz von Stuck's famous oil painting Inferno, painted in 1908 (Fig. 1), which was sold at Christie's in London in the German and Austrian Sale on 9 October 1997, Lot 64 where it achieved the price of GBP 221,500. There is a strong compositional rapport between the present lot and Rodin's Thinker which was placed at the pinacle of the Gates to Hell, Rodin's great bronze scuplture.